Home / Uncategorized / This Weekend’s Drink Offer. We have three shows this weekend; the sky rocketing Jawbone will be performing songs from their debut album on Thursday evening, followed on Friday by Clearwater Creedence Revival; the best CCR tribute in the UK and finally on Saturday we have the future of folk in Sam Carter. 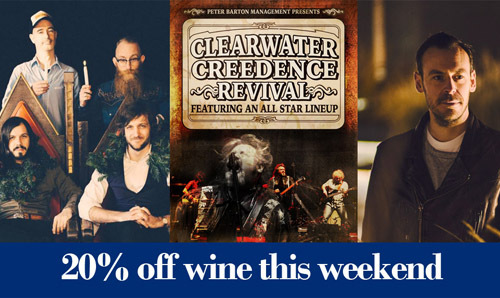 If that wasn’t exciting enough we’re offering you 20% discount on large bottles of wine. Just order at the bar as you usually would!